The Tragedy of American compassion. · One Book. One Author. One Hour. The Tragedy of American compassion. Notes on front endpapers: 7 Marks of compassion p. 101: 1.Affiliation, 2. Bonding, 3. Categorization, 4. Discernment, 5. Employment, 6. Freedom, 7. God. Olasky's grandparents are immigrants. Underlinings/Notes: Underlinings: Theism--important for better off to know the poor individually. Most important need of unfaithful poor was to learn of God. Mather-don't nourish and harden 'em, find them employment. In-kind vs. cash gifts. Religion underlay most charities. Hardness--need to suffer in order to be willing to change. Jacob Riis, liberal reformer, "How the other half lives," no work, no food. Freedom grasped only with responsibility. Prior to Great Society, welfare considered even by recipients as necessary wrong, not a right. 1960s poverty socially caused, socially cured. Impact of programs. Notes: "Poor, Free market or gov. intervention," "George Wiley,""10th century war on poverty," "Legal Services," "AFOC 1950 to 1960s," "NWRO 1968-1971,""13% poverty rate," "compassion," "single parenting," "Most homeless are 20 to 30 and black," "Leftists and urban centers," "federal government," "work test requirements," "poverty, theology & God." 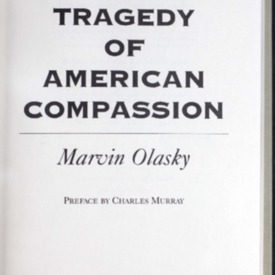 Olasky, Marvin N, “The Tragedy of American compassion. ,” One Book. One Author. One Hour., accessed April 21, 2019, http://booknotes.gmu.edu/items/show/711. Dr. Marvin Olasky's work regarding poverty and government programs. "Social work with the homeless--United States--History."